Joseph Schooling of Singapore took home gold in the 100m butterfly. As the Olympics wind down, it’s customary to argue about which parts of the world performed best relative to expectations. The U.S. is a reasonable answer. Maybe Armenia. Probably not India. Definitely not Russia. Here’s a dark horse candidate: Southeast Asia. Through Aug. 19, 2016. 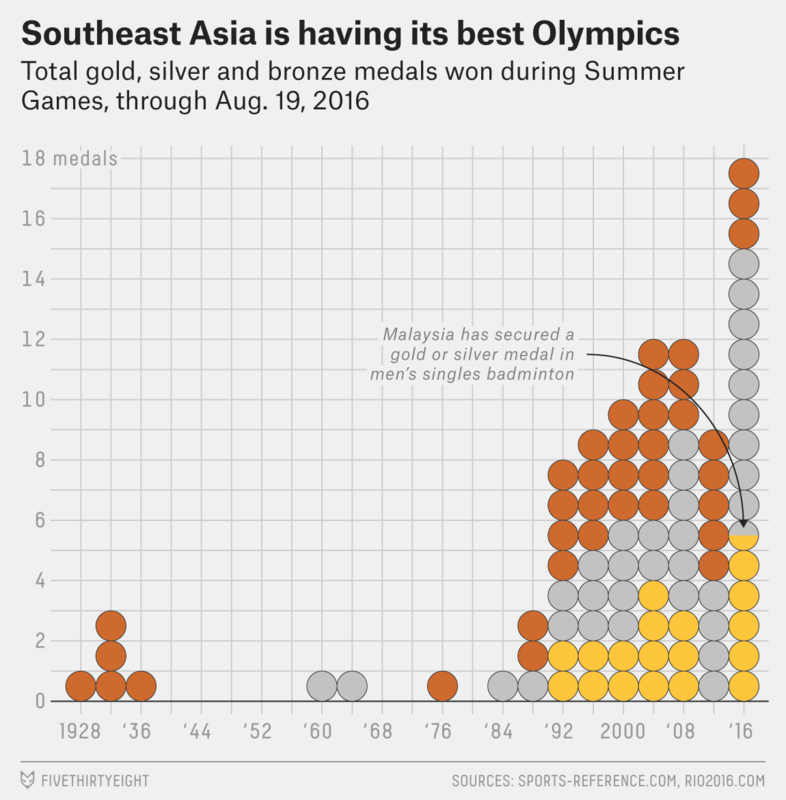 Includes a 2016 medal for Malaysia’s Lee Chong Wei, who is guaranteed silver or gold in men’s singles badminton. Myanmar, Laos, Cambodia, Timor-Leste and Brunei have never won Olympic medals, nor did now-defunct South Vietnam, Malaya and North Borneo. The weightlifting specialization may explain some of the 2016 bump. Many of 2012’s best weightlifters were absent from Rio following doping allegations, and the Russian and Bulgarian teams were outright banned. Southeast Asian countries won just two silvers and two bronzes in these events in 2012; in 2016 they snagged two golds, four silvers and a bronze. There are more medal opportunities to come. On Saturday, Sorn Seavmey of Cambodia, seeking her country’s first-ever medal, will compete in the round of 16 in women’s over 67kg taekwondo, as will Kirstie Alora of the Philippines. And Malaysia’s Lee Chong Wei — silver medalist in men’s singles badminton in 2008 and 2012 — will compete in his third straight gold medal match. We’re using the standard definition of Southeast Asia, which comprises 11 countries: Brunei, Cambodia, Indonesia, Laos, Malaysia, Myanmar, the Philippines, Singapore, Thailand, Timor-Leste and Vietnam. In terms of historical Olympic results we’re also including the now non-existent entities of South Vietnam (1952 to 1972 Olympics), Malaya (1956 and 1960) and North Borneo (1956), although none medaled.